The Philadelphia Art Alliance presents "The Way of Chopsticks"
The Philadelphia Art Alliance’s fall centerpiece exhibition explores the roles of family, collaboration, fabrication and the passage of time in a site-specific setting, taking up the entirety of PAA’s interior space as well as the roof and exterior. Song Dong and Yin Xiuzhen: “The Way of Chopsticks,” on view Sept. 12 to Dec. 29, 2013, and supported by the Pew Center for Arts & Heritage, investigates domestic, cultural and generational environments literally, through found objects, humble materials, and videos that capture moments from daily life. The Beijing-based husband-and-wife artists, known for their collaborative chopstick sculpture series that began in 2001, will respond to PAA’s site, a former mansion, by creating six new pairs of chopstick sculptures, each with different variables, as well as sculpture and a two-channel video on the theme of childhood in contemporary China. For “The Way of Chopsticks,” the artists plan to work with their 11-year-old daughter, Song ErRui. 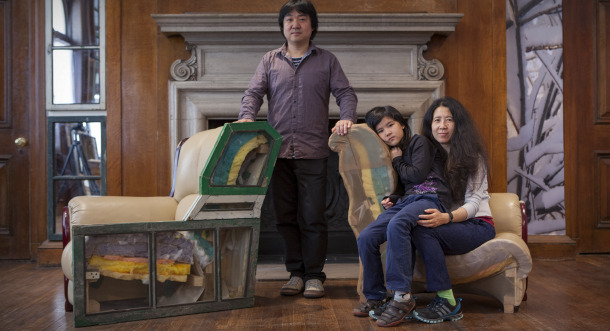 Song Dong is best known in the U.S. for his 2009 work at the Museum of Modern Art, Waste Not, composed of the contents of his mother’s house accumulated over the course of 50 years, from plastic slippers to empty toothpaste tubes and other ephemera. Yin Xiuzhen imbues her sculptures with a feminist point of view by using materials such as recycled clothing, fabric and thread to create installations that address domesticity and transience in contemporary China. The Philadelphia Art Alliance is dedicated to the advancement and appreciation of innovative contemporary art with a focus on craft and design, and to inspiring dynamic interaction between audiences and artists in a setting of historic and aesthetic significance. Hours: Tuesday through Sunday, 11 a.m.-5:30 p.m.
Thursday, September 12, 7-9 p.m. The Philadelphia Art Alliance is located at 251 S. 18th St., Philadelphia, PA 19103. For more information, visit philartalliance.org or call 215-545-4302.